DeWalt debuted the newest 20V MAX* Bluetooth Enabled Green and Red Rotary Tough Lasers, three extended range Laser Distance Measurers, and a pocket-sized convenience Laser Distance Measurer at World of Concrete 2018. DeWalt 20V MAX* Bluetooth Enabled Green Rotary Tough Laser (DW080LGS) and DeWalt 20V MAX* Bluetooth Enabled Red Rotary Tough Laser (DW080LRS): An enhancement to the DW079LG 20V MAX* Green Rotary Tough Laser, the DeWalt DW080LGS and DW080LRS Rotary Tough Lasers feature Bluetooth connectivity, which allows the unit to connect to the Tool Connect app for mobile functionality. With an IP67 debris/water resistance, 2 meter drop protection, as well as a highly-visible green beam or traditional red beam, these Rotary Tough Lasers performs in adverse jobsite conditions, provides accuracy of +/- 1/16” at 100 ft., and has an interior range of 250 ft., or an exterior range of 2,000 ft. with the use of a detector. Available beginning Q2 2018 where DeWalt products are sold, the DW080LGS, DW080LRS and 20V MAX* family run on a 20V MAX* Lithium-Ion battery platform, providing users long run times and the convenience of rechargeable power tool batteries. All DeWalt Rotary Laser models come standard in a DeWalt TSTAK Storage Case for additional convenience. Included with the DW080LGS is a 12V MAX*/20V MAX* charger, 2Ah 20V battery, detector, ceiling bracket, laser enhancement glasses, target card and remote control. DeWalt 330-Ft. Bluetooth Laser Distance Measurer (DW0330S) connects via Bluetooth to store and save measurements and mark up photos on the DeWalt Tool Connect app. This LDM can measure distances up to 330 ft. with an accuracy of +/- 1/16” at 30 ft.. The compact unit features a 2.25-in. (measured diagonally) color, backlit high contrast LCD screen that provides visibility in various lighting conditions. Continuous measurement tracking quickly and easily finds the distance from a target as well as calculating area and volume and saving historical measurements for reference to the last three measurements. All measurements can be taken in three units (feet, inches and meters). An over-molded grip supports a firm hold and drop protection, while a wrist strap connection provides carrying convenience. 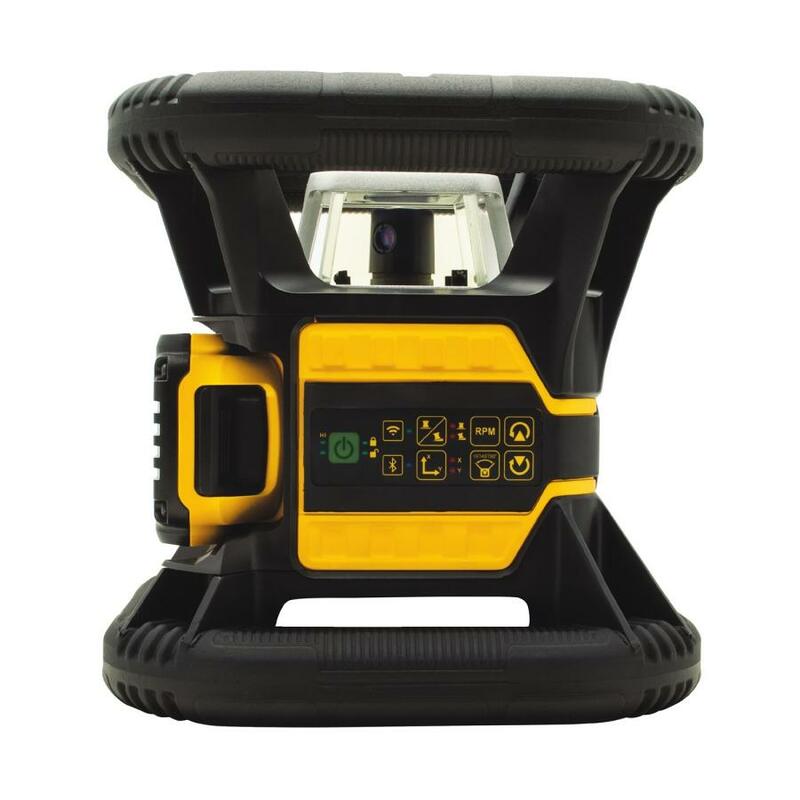 Other functions include Pythagoras for room volume, as well as performing simple addition and subtraction functions The DeWalt 330-ft. Laser Distance Measure includes two AA batteries. MSRP is $179.99. DeWalt 165-ft. Bluetooth Enabled Laser Distance Measurer (DW0165S) connects via Bluetooth to store and save measurements, mark up photos on the DeWalt Tool Connect app. This LDM can measure distances up to 165 ft. with an accuracy of +/- 1/16” at 30 ft. The compact unit features a 2.25-in. (measured diagonally) color, backlit high contrast LCD screen that provides visibility in various lighting conditions. Continuous measurement tracking quickly and easily finds the distance from a target as well as calculating area and volume and saving historical measurements for reference to the last three measurements. All measurements can be taken in three units (feet, inches and meters). An over-molded grip supports a firm hold and drop protection, while a wrist strap connection provides carrying convenience. Other functions include Pythagoras for room volume, as well as performing simple addition and subtraction functions. TheDeWalt 165-ft. Laser Distance Measure includes two AA batteries and. MSRP is $149.99. DeWalt 165-ft. Laser Distance Measurer (DW0165) is for professionals seeking a compact, easy-to-use laser measure with 165-ft. range with accuracy of +/- 1/6” at 30 ft. A backlit high contrast 2.25-in. (measured diagonally) color LCD display for visibility in various lighting conditions and the unit supports quick measuring for area and volume to support a variety of applications including painting and flooring estimates. The DeWalt DW0165 includes two AA batteries. MSRP is $99.99. DeWalt 100-ft. Bluetooth Enabled Distance Measurer (DW099S) measures distances of up to 100 ft. quickly and easily. The Bluetooth enabled, compact unit features a 2.25-in. (measured diagonally) LCD screen. Continuous measurement tracking quickly and easily finds the distance from a target as well as calculating area and volume and saving historical measurements for reference to the last three measurements. All measurements can be taken in three units (feet, inches and meters). An over-molded grip supports a firm hold and drop protection, while a wrist strap connection provides carrying convenience. The DW099S includes AAA batteries. MSRP is $99.99. More information, including where to purchase is available by visiting DEWALT.com. Users can download the DeWalt Tool Connect app from the Apple App Store and the Google Play Store. Join the World of Concrete conversation by following DEWALT on Facebook, Twitter, and Instagram and #DEWALTTOUGH and #WOC2018. * With respect to 12V MAX* - Maximum initial battery voltage (measured without a workload) is 12 volts. Nominal voltage is 10.8.With respect to 20V MAX* - Maximum initial battery voltage (measured without a workload) is 20 volts. Nominal voltage is 18.